Traditional parking lifts have a familiar structure: four posts, one on each corner, and a full-length platform that rises and descends along the posts. This structure has benefited homeowners and businesses in the past, but it has its downsides. Likewise, some smaller-footprint lifts have tilt-back designs that angle the vehicle on top. Let’s look at why it’s safer and more convenient to park with Autostacker, both when parking on top of the platform (upper level) and underneath a raised vehicle (lower level). When you pull a vehicle up to the short approach ramp, you’ll notice how easy it is to drive onto the platform. Even low-stance vehicles that barely meet street legality requirements will pull up without scratching the front. This is because the platform itself inclines all the way up to the wheel stop. 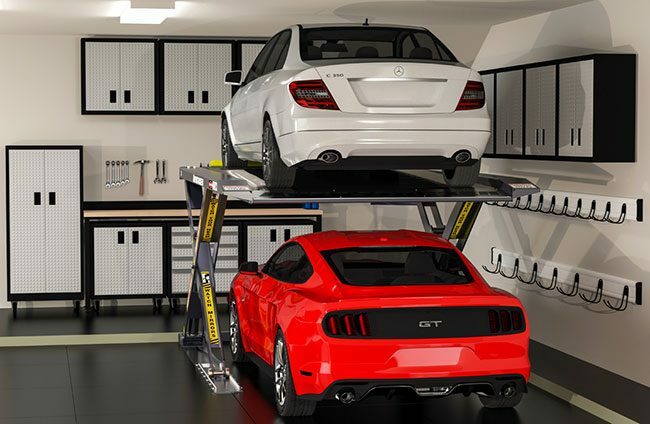 By gently inclining the drive-on platform, Autostacker can handle a wider variety of low-ground clearance vehicles than virtually any other parking lift. Another great feature of the upper level, the lift platform itself remains completely level as it rises and descends. The absence of any tilt leaves more room underneath for the lower-level vehicle. This clever design permits up to 80” of clearance underneath. Furthermore, two powerful hydraulic cylinders push from directly underneath the vehicle, eliminating side-load compensation that needs to be engineered into four-post parking lift structures. The simplicity of Autostacker’s design extends the lifespan of your hydraulic cylinders, as well as the structural integrity of your lift. As mentioned, Autostacker provides 80” of lower-level clearance at the top lock position. This stands in stark contrast to other parking lifts that permit only low-stance vehicles underneath. Autostacker is also protected on both sides by the scissor arms. Four-post lifts leave vehicles open to accidental damage: reckless kids, a heavy object, etc. Nestled underneath, your most precious vehicle will be safe from harm, including oil/liquid drips from above. And last but not least, patented Door-entry™ door cushions fold seamlessly in and out of the scissor structure. Placed where a hard-swung door is most likely to make contact with the lift, only Autostacker has this level of protection built right into its structure. Autostacker is designed with a customer-comes-first attitude. We incorporate anything we can do to make your parking experience safer and more convenient right into the parking lift structure. We “stack” onto that a dedicated, fast-responding customer service line to help you with any questions you might have. With a one-of-a-kind design and unparalleled service after the sale, Autostacker offers the ease-of-use and peace-of-mind you, your family and your vehicles deserve. Two Cars. One Platform. Zero Posts. © 2018 BendPak Inc. Autostacker is a division of BendPak. Patent pending.